We went back into the hotel and changed clothes. Today was probably the hottest day of our trip, so we both wore shorts for the first and only time. I don’t know if it was the time of year we were there (early September), but we saw very few people wearing shorts. Most people wore long pants and dark colored clothing. 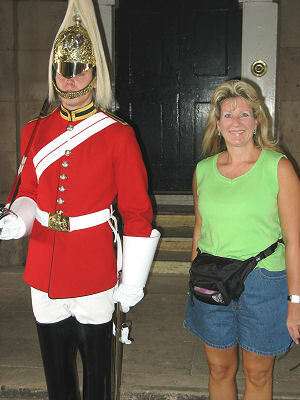 We walked back to the Horse Guards where we had been on our first day in London and Susan got a picture standing next to one of the guards. The guard looked simply thrilled to be there. From there, we walked through St. James Park for the second time. The first time we were rushed, trying to keep up with the Horse Guards Parade as they were making their way to Buckingham Palace. The park has large lawns, a pond, chairs you can rent by the hour, and a restaurant and cafe called Inn The Park. After strolling through the park, we walked to Buckingham Palace again. This time there was not a large crowd because the changing of the guard was not taking place today. Because there is a huge traffic circle in front of the palace, and there are lots of pedestrians here, they have placed fences to keep pedestrians from crossing the road in all but a few spots. We had to backtrack and find the crosswalk so we could get to the front gates of the palace. 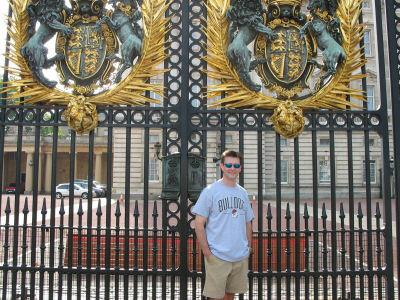 Once there, we were able to get a close-up view of the gate, the guards, and the front of the palace. The Queen happened to look out the window and she saw my Georgia Bulldogs T-shirt. She screamed out “Go Dawgs!” Okay, that didn’t happen. But it could have. 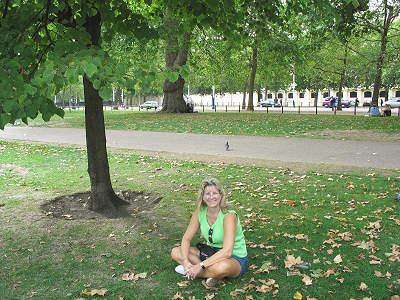 We walked north of Buckingham palace, just across the street, to The Green Park. This was another beautiful and peaceful park and we stopped at a refreshment stand to purchase a Diet Coke which was £1.50. We walked east towards St. James Palace, then began walking up The Mall. Susan noticed a sign that said Clarence House, and she said that this was the residence of Prince Charles and his wife Camilla, Duchess of Cornwall. She had read that you could tour the residence, so she went to the gate and asked the man standing there if it was possible to take a tour. He said that they were booked until September 18, so there was obviously no way we were getting in there. Book early for this one! We left there and continued walking up The Mall, stopping on the east end of St. James Park. We sat on the grass underneath a tree and enjoyed the beautiful weather and tranquility of the park. There were many other couples throughout the park doing the same. After about 15 minutes we decided to leave, and walked to the Strand where I’d seen an Internet café. This was the first time in probably nine years that I had been without an Internet connection for more than a couple of days. I had decided not to bring my laptop, but I needed to check a temporary e-mail address I had set up for myself and send an e-mail back to my employee in Atlanta. We had Internet access at the hotel, but the concierge told me that it would be cheaper if I went to the Internet café. After finishing our emails, we left and went the short distance to Covent Garden, where we had been on Sunday. It was dinner time and we looked at menus outside several restaurants. Not finding anything that made our mouths water, we decide to go back to Maxwell’s. Yes, we are pitiful dining thrill-seekers. EXCUUUSE ME! We were seated near the front of the restaurant, and had the same waiter we had the first time. 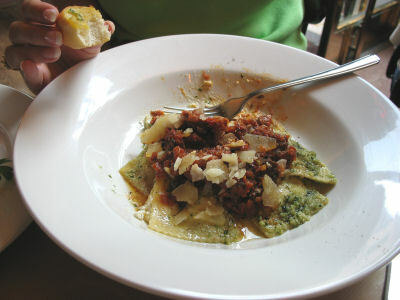 Susan ordered the same thing she got the first time, cheese ravioli and garlic bread. I ordered a dozen hot wings (£7.95), which were meaty and spicy. I also got an order of onion rings for £3.50. The menu said it was enough for two people, but that was a bit of an exaggeration. Our meal and service were good, once again. We decided it was time to head back to the hotel. Susan wanted to get some bottled water, so we went into one of the many drugstores on the walk back home. A 2 liter bottle of water was 95 pence. We also bought 2 large size candy bars, at 58 pence each. We walked back to the hotel and made it to the room at 7:30 p.m. Susan was soon asleep. I worked on this journal and watched TV. I turned out the light at 11:30 p.m., but couldn’t sleep and got out of bed at 12:30 a.m. I headed down to the lobby, hoping the exercise room was open. Unfortunately, it closed at 11:00 p.m. So I grabbed some tour company brochures from the rack near the concierge desk, sat down in the lobby and studied them. There were some very interesting tours that we wouldn’t have time to take! Most were all day affairs that required catching a tour bus early in the morning, visiting three or four sights outside of London, then returning in the evening. They looked fun, but we just didn’t have any more days left since we already had plans for Thursday. Maybe next time. At 1:30 a.m. I went back to the room, and went to sleep.